For a few minutes every day, you have the opportunity to create magic with your camera. Sure, photography is always a little magical, allowing us to see things you normally can’t with the naked eye. Stopping time for a split second, making one moment last forever. But one of the most magical times of day to shoot is Blue Hour… when, for just a few minutes, even cloudy skies turn cobalt blue in the camera. This month’s Breakfast Stock Club Premium Challenge is all about how to take stock photos during Blue Hour… so I’ve asked stock photographer Danny Warren to share the story of one of his most successful blue hour stock photos, below. When I saw the first twinkle of stars, I knew the shot would be perfect. The sun had already sunk below the horizon, but there was still enough light to subtly define the rugged Sierra Nevada peaks around me. Wispy clouds raced above in the wind, reflecting the gentle pink hue of the last remnants of the sunset. The light was perfect, but I knew it wouldn’t last. My camera was ready on my tripod with the composition and focus locked in. I called out to my wife in the tent to switch on her headlamp and wave it around as fast as she could–a trick I learned long ago that produces nice even light to make the tent look like it’s glowing. I clicked my remote to open the shutter and looked down at my watch, waiting 90 seconds before hitting the remote again to close it. Even at 90 seconds, it was still a little underexposed. I took another one, adding an additional 15 seconds to my shutter speed. Afterwards, I held my breath and hit the preview button–I instantly knew this would be one of my favorite shots I ever captured. More stars than I could see with my eye dotted the sky. 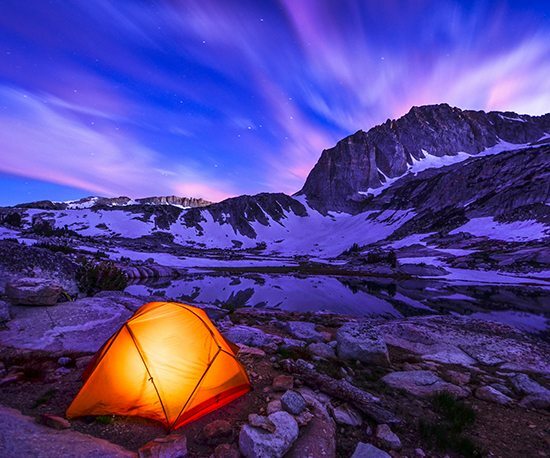 The exposure on the tent was even and bright without blowing out highlights. There was detail in the foreground and peaks behind. And my favorite part – the clouds that seemed so insignificant to my naked eye turned into vibrant pink brush strokes, exaggerated by their movement over the long exposure. These final moments of daylight have always been my favorite time to take pictures outdoors. Photographers have long called the phase right before the sun rises and after it sets the Blue Hour. It’s not hard to understand why they love it. The light is soft and hues of blue and gentle pastels diffuse through the sky and across the landscape. Familiar scenes that look drab and boring during mid-day take on a whole new identity. Cityscapes glow, reflections of lights dance over water, and colors shift in ways that are hard to fully imagine until you see them on your camera. The Blue Hour should especially not be overlooked for stock photographers. Capturing images at twilight can add aesthetic appeal and provide a unique look compared to other images of the same location. The darkness can also be used strategically to hide unwanted components such as unsightly trash bins or copyrighted signs. Back in the Sierra, I took a few more shots, but it was soon too dark to retain detail in the terrain. I crawled into the tent and looked at the image one more time to make sure it was as good as I remembered. Little did I know I would later see it used in books, magazines, and even by Apple on a template in Keynote. All things I am grateful for and proud of, but for me the real reward was being in a stunning spot, graced with a little luck, to capture a moment that will live forever in my memory – and on my wall.